Pisofttech Pilot Era is a compact professional 360 camera with in-camera stitching up to 8K 360 resolution. Here are hands-on impressions based on a prelease unit that I’ve been testing. I also show full resolution sample 360 photos and 360 videos. April 11, 2019 update: video resolution increased to 8K 24fps (firmware 4.1.1). 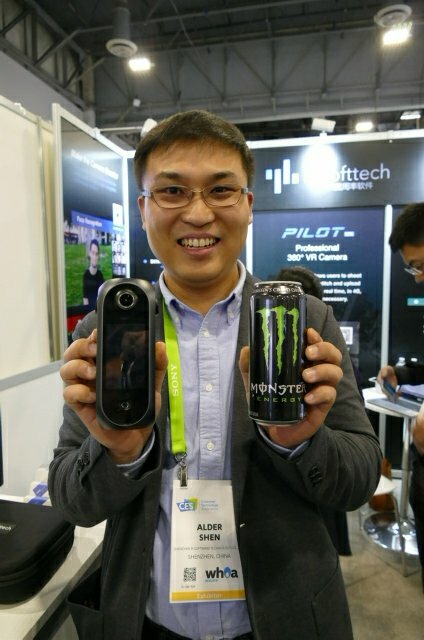 At CES 2018, I met Pisofttech’s CEO Mr. Shen and CPO Mr. Gao and they explained that Pisofttech specializes in software and has been working with 360 camera manufacturers for a few years now but has finally decided to create its own camera, hence the Pilot Era. The Pilot Era is very compact, with about the same dimensions as a regular-sized 16 oz. Monster Energy drink. I had a chance to use it at IVRPA 2018, and Pisofttech has sent me a beta unit (with nonfunctional audio) for testing. 1. Realtime stitching for 6K video 15fps. 6K video can be stitched in realtime, in-camera. Imagine never having to spend time stitching 6K video. 2. In-camera stitching for 8K video. With 8K video, stitching is not in realtime but can be done entirely in-camera. It takes approximately 2 mins to stitch 1 minute of video. By comparison, Insta360 Pro’s in-camera stitching takes 14.4 minutes per minute of video. Most other 8k 360 cameras can’t stitch 360 video at 8K at all and instead require a powerful desktop for stitching. If the user wishes to use third party stitchers, the camera can output to fisheye format. As of April 11, 2019, the firmware has been updated to enable in-camera stitching of 8K 24fps video (previously, the video was 8K 20fps). 3. A hybrid stitching approach. Some cameras use simple template based stitching which is fast but can only stitch correctly at one distance. Anything farther or closer will have stitching errors. Other 360 cameras use optical flow stitching for smoother stitching but it is very processor-intensive and time consuming. Pilot Era uses a hybrid stitching approach that Pisofttech claims to be comparable in accuracy to optical flow stitching but is much faster. In the demos we did, the stitching looked smooth for anything at least one meter away from the camera. The zenith also looked smooth because the Pilot Era’s lenses are pointed slightly upward, resulting is more overlap at the zenith. The nadir stitching was less smooth but was still decent. 4. Stabilization. 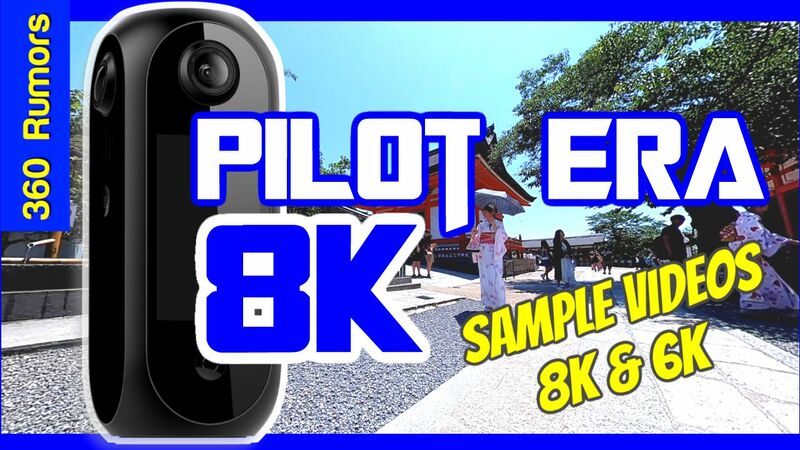 Pilot Era uses AI to stabilize the video in addition to an internal gyroscope. 5. Intuitive touchscreen controls. The Pilot Era has a color touchscreen with controls that are as intuitive as the controls on a smartphone camera. 6. In the future, they will add additional AI features, such as face recognition, gesture recognition, and being able to generate a depth map from a 2D 360 video. Here is an older sample. To me, the video samples have impressive detail. The dynamic range could be better, but it’s not bad. I also like the natural-looking colors and contrast. Stitching is better than I expected for a camera of this size, and looks quite smooth except at the nadir. 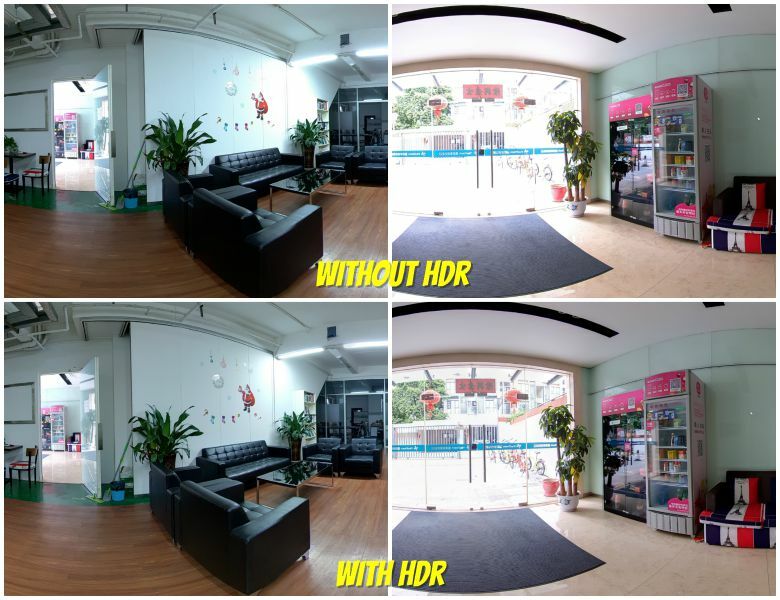 According to their representative, users can select the exposure interval for the HDR shots, up to +/- 4EV. Pisofttech sent me a prerelease version of the Pilot Era, which I have been testing. Here are my first impressions. The camera is very compact compared to other professional 8K 360 cameras I’ve used such as the Insta360 Pro, Insta360 Pro 2, Kandao Obsidian, or Detu Max. It is also much more compact compared to the Z Cam S1, a professional 6K 360 camera that also uses four lenses, like the Pilot Era. The Pilot Era’s compact size makes it easy to bring it everywhere and shoot with it without drawing too much attention. 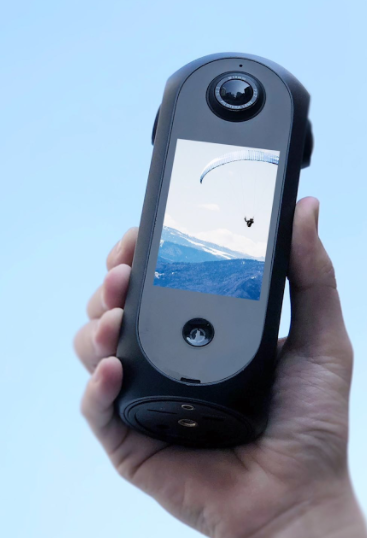 Besides the Pilot Era’s size, the other major difference compared to other 360 cameras is its large 3.1-inch touchscreen. The touchscreen is similar in image quality to a smartphone screen. Indeed, the Pilot Era runs on Android and its icon-based interface is very similar to a smartphone, and is very intuitive and responsive. The touchscreen not only provides an easy interface for controlling the Pilot Era, but is also useful for live view and for reviewing photos without having to connect to a smartphone. Shooting with the Pilot Era is very intuitive. The screen shows four shooting modes: photo, unstitched video (with four dots), stitched video, and Google Street View. For each shooting mode, you can choose your desired resolution and framerate. The photo mode also has an HDR option. For video mode you’ll also be able to adjust the stitching distance. As of April 2019, the stitching appeared to be purely template based, albeit adjustable. I did not see evidence of a hybrid stitching feature. For stitched videos, the videos will be immediately viewable on the gallery, which you can access either from the thumbnail on the bottom left corner of the live view screen, or from the main menu. For unstitched videos, you’ll see an outline of a jigsaw puzzle icon, which indicates it is unstitched. Tapping on the jigsaw puzzle icon initiates stitching, which is quite fast for an 8K video (around 2:1 ratio). The workflow is very convenient, and it is actually easier to use than most consumer 360 cameras (and professional 360 cameras), although I wish that it had batch stitching. 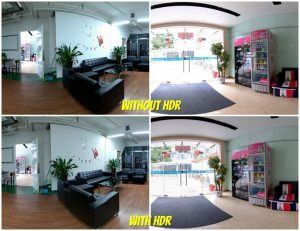 As for image quality, the videos look detailed although the dynamic range does not appear that much different from consumer 360 cameras. Another issue is the stabilization. Although the video is stabilized, the four lenses seem to follow their own stabilization, which do not seem to move in sync (as of the March 2019 version). I will be conducting further tests to compare the videos to 5.6K and 8K cameras including Insta360 One X, GoPro Fusion, and Rylo. With respect to storage, Pilot Era doesn’t use an SD card. Instead it has a large 512GB internal memory (enough for 6.5 hours of 8K video). I transfer videos to my hard drive through a USB Type C cable. In addition to its large internal memory, Pilot Era also has a very large 7200 mah battery (sufficient for 3.5 hours of 8K video recording), which is removable and can be charged in-camera via the USB Type C port. Pilot Era also includes a base stand accessory that can be used to add an Ethernet jack for live streaming. The Pilot Era is estimated to be around $2600, and will launch on Indiegogo in early May, with a few units available at the Super Early Bird price of $1799 (a discount of $800). For more news on the Pilot Era, including an upcoming video of the Pilot in use, please bookmark this page. In the meantime, here is Pisofttech’s official webpage, where you can sign up to be notified when their Indiegogo campaign goes live. Hi Dean. I’ve updated the post with more info re stitching, etc. No editing software yet but they will probably include a simple editor. Will find out whether battery is removable. – what kind of storage does it support like SSD (internali placed M.2/USB) or SDXC? Hi Bruno. The lenses are not replaceable. I’ll ask about heat dissipation. Great questions. Waiting for the responses. What sensor and exposure controls, thermal cooling and over heating issues or limited record time? Video examples are only at 4K but stitching is perfect! Very sharp looking image as well, with great detail. Colours look good too, however one of the examples looks quite under exposed, and the sky in the other example is quite blown out towards the sun (no HDR available?). Also, one video is only 13.5 Mbits/s the other is 30 Mbits/s, what is the max bitrate? There is a rather nasty red dot flare in one of the examples, is it prone to flare in certain situations? Good sleuthing! Great questions. Waiting for the responses. You state 8K @ 30FPS but their website tech spec has 8K @ 24FPS. Is theirs out of date? My information is more current. It is based on the press release. OK the press release just got updated an hour ago and they changed the 8K framerate to 25fps…. will revise. could you do a comparison to the Insta 360 Pro 2? Is Image quality of the Pro 2 better? especially HDR. Hi Paulo. Yes I will post a review of the Pro 2. As for Pilot Era, it seems they changed their mind and don’t seem interested in sending a unit for review anymore. hi Mic ! happy holidays ! is there any update on the device ? as it’s already put to the public ? any compare with other Pro level devices like Insta360 Pro v2 ? GREAT !!!! pls don’t cook turkey or any other activity that will distract you from the testing LMAO !!! enjoy holidays and have a great new year with family ! warm greetings from CR ! I will upload samples tonight or tomorrow! Google Street View Trusted Photographers and IVRPA members enjoy a refund of $300 each Pilot Era camera. Thanks for the info. Right now it doesn’t look to promising.